Anybody who pays attention to recreational real estate has noticed a growing trend, or more accurately, a movement, towards building tiny homes. In fact, that’s even what it’s called: The Tiny House Movement. While luxury homes can be beautiful, designed to meet every whim of the occupant, there is something to be said for building small. First and foremost, you are treading lightly on the land, consuming few resources and energy in the construction process. They’re also relatively inexpensive to build, and a tiny home project can be completed in a matter of weeks versus months. And those who live in tiny homes describe the experience as one that brings people closer together, literally. This movement hasn’t gone unnoticed by Gambier Island settlers, many of whom have built small structures to help them establish a base camp on their land. A mere 25km from downtown Vancouver, Gambier is a world away. A few islanders have gone all out to build full size luxury homes, but frequently this means engaging contractors at considerable cost. Those who opt to do it themselves and take their time following a staged approach. First setting up a simple camp, putting in a few amenities such as an outhouse or composting toilet, and then building a simple shack which they can use as a base camp, kitchen, tool storage and art studio all rolled into one building. 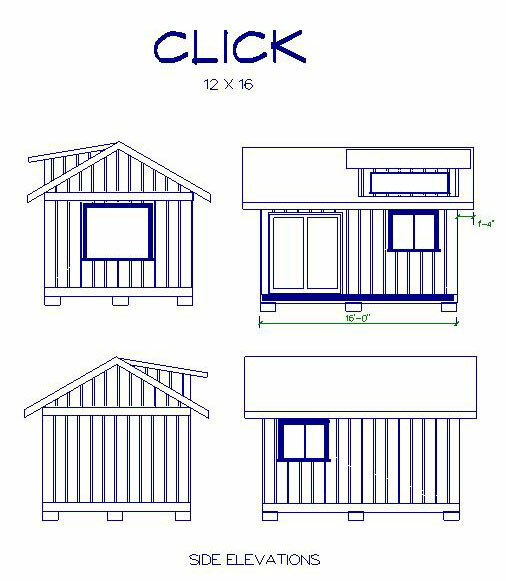 Having watched Gambier settlers tackle the challenge of developing their properties, and learning more about the tiny house movement, our development team has realized that some prospective buyers would like to bypass the hardship of starting from scratch on raw land, and decided to provide the option of purchase with a small outbuilding already in place. After careful consideration and planning for what sort of features homesteaders would be looking for in a small structure, Click Modular Homes was commissioned to build a fully permitted 12′ X 16′ outbuilding with 6′ X 8′ loft and 8′ X 16′ deck., and a 3′ X 4′ outhouse. 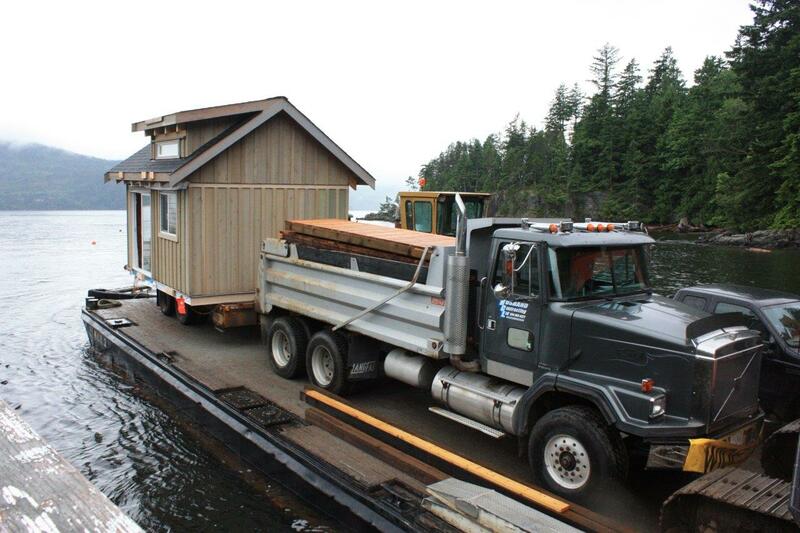 Pre-built at Click’s workshop in Gibsons, B.C., and then transported to Gambier Island’s Fircom Plateau community. .Lumber from a neighbouring sawmill was hand selected,the structure is simple no electricity, no plumbing, no heat, and no insulation. Not technically habitable, but enough to give a prospective owner a foothold on the land. If the full homesteading process seems daunting for some, then jump starting the process with an outbuilding will allow them to start using the land immediately and focusing on plans for what they’d like to do next.